What stood out to me when reading this article on walkie-talkies is a statement made near the end where the author claims regarding loaded whip antennas, "Transmit losses are many times greater than receiver losses." The last time I checked, passive antennas are reciprocal devices, so gains or losses should be the same for transmit and receive. Methinks he either didn't know that, or he meant something else. 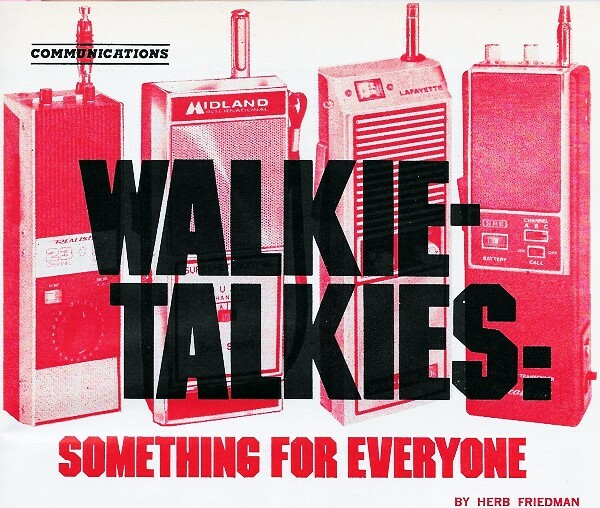 My main reason for posting the article is because it pretty much completes the evolution cycle of walkie-talkies, which started life being called handie-talkies when being developed during World War II as lightweight, portable 2-way radios that could be deployed in regions of difficult travel and even carried by paratroopers. Nowadays, most 'serious' handheld transceivers operate in the 462-467 MHz Family Radio Service (FRS) band, rather than in the 27 MHz Citizens Band as did early models. The neighborhood where I grew up in the 1960s and 70s had a lot of kids in it, and we boys did a lot of playing war, cops and robbers, detectives, etc., and often used cheap walkie-talkies as part of the activities. They were usually so bad that yelling back and forth had more effective range than the radios. 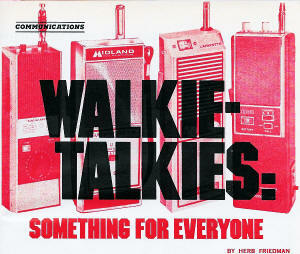 Children eagerly look forward to getting a toy walkie-talkie (w-t) for Christmas or birthday presents. To their big brothers, those walkie-talkies aren't toys but indispensible units for things like relaying football plays from the stands to the high-school teams. On the top of the heap with much better w-t's are the CB'ers involved in REACT and Rescue Team programs where the compact communicators can prove invaluable over relatively short distances. And outside workers have adopted the w-t as their principal "no-wire" communication system. The CB walkie-talkie which began life as a plaything for children has grown into the most popular communication device of the day. The reason for the popularity of the relatively low cost w-t that operates on the CB frequencies is due to there being a model almost tailor-made for any applications. Whether you are looking for a cheap present for a child, a tone-controlled radio tripper device for woodland photography, or a pocketful of power for search-and-rescue operations, there is a CB w-t to fill your need. Low-Cost W-T's. 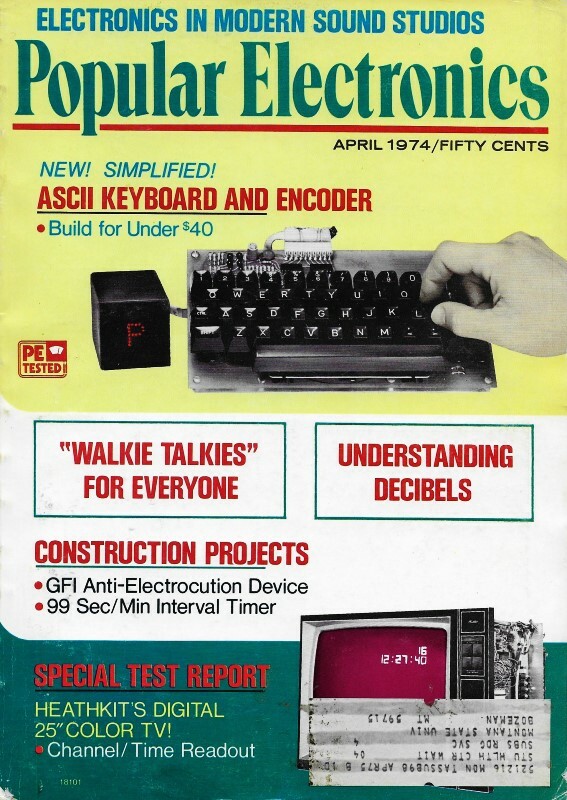 The basic CB walkie-talkie, priced at less than $20, is usually a three- or four-transistor device with a super-regenerative receiver and a simplified single-frequency, crystal-controlled transmitter. Its power input is generally stated at a nominal 100 mW, making it license-free (anyone can use it), although the actual input might be as low as 20 mW, providing a dependable range of only two or three city blocks. The superregenerative receiver, noted for a sensitivity almost the equal of a good superheterodyne receiver, is also noted for its poor selectivity. The less-than-$20 w-t might well receive every signal frequency on the Citizens Band, regardless of the frequency to which it is tuned. Still, the least expensive w-t does make a desirable gift for children. But for more serious work, one inevitably must look to more expensive models. Moving up the ladder to the $25-$50 range, you will find 100-mW models that are really useful. Featuring superhet receivers and fully modulated 100-m W transmitters, these w-t's serve a very useful purpose for short-range work. The transmitter and receiver sections are crystal controlled, and some means is provided for easily changing crystals. The receiver generally contains an r-f preamplifier and a 455-kHz i-f amplifier. The i-f section can provide as much selectivity as can be expected of an inexpensive 5-watt base or mobile CB rig. Models near the top of the price range often feature an extra stage of i-f amplification, or a ceramic or mechanical filter for more selectivity to yield performance that approaches that of the better single-conversion 5-watt transceivers. Unlike the superregen w-t's that usually use small 9-volt batteries with average lives of 2-4 hours, the low-cost superhet w-t uses some type of "penlight" battery, whether it is throw-away or rechargeable being left up to the user. Depending on the type of battery used, you can expect anywhere from 20 to 50 hours of dependable service before it must be replaced or recharged. A full 100-mW input power w-t will have a reliable range of about one mile in open country, less in areas where the terrain is interrupted by hills, buildings, etc. One important advantage of these units is that they can be used at relatively short range without overloading the receiver; higher powered models generally overload at close range. While there is usually no need for multi-frequency capability, it is conceivable that you might have to communicate with two or more systems operating on different frequencies. The higher-priced 100-mW models ($35 and up) can give you two or three switch-selectable channels, and they often include some form of tone signaling system to get the monitor's attention. Another feature you get is a "talk-power" modulator, with speech clipping or compression similar to that found in 5-watt rigs. Except for the "stripped" models in the $50 price area, most high-power CB w-t's have features you would expect to find in quality mobile equipment, starting with a power input jack that permits operation from an ac-operated power supply. All models have squelch controls, antenna jacks, earphone jacks, and S/r-f meters that double as battery-condition indicators. Some models have only a battery-condition indicator. The circuits in the high-power units are often identical to those used in higher quality base and mobile CB rigs. Receiver sensitivity is generally 1 μV or better, while selectivity can be 50 dB or greater between channels. Depending on total cost (high-power w-t's ranging from $50 to almost $200), you might have a choice of three to 23 channels coverage. In most cases, 23-channel models are supplied with all crystals. (You pay for all whether you need them or not.) One 23-channel model is presently available on a build-up basis; you purchase only the crys­tals you want as you go along. For w-t's with less than 23-channel coverage, you add a channel at a time. The usual two crystals, one for transmit and the other for receive, are required. As a general rule, the higher power models have some type of "talk power" booster. Though the high-power w-t's provide extended range, they also prove a decided convenience for short-range work when portability is a prime requirement. The length of antennas used with CB w-t's can run up to and beyond 4 ft. Hence, one of the most convenient accessories to have is a loaded whip antenna whose total length is 12 in. to 18 in. Their short length easily adapts the w-t to belt or shoulder-strap carrying use. Unfortunately, loaded whips have very low efficiency. When used on a 100-mW unit, the signal might not make it the length of a city block. (Transmit losses are many times greater than receiver losses.) But with a loaded whip on a 3- or 5-watt w-t, there is still plenty of power available - more than enough to cover a large office building, school, stadium, or playground. A secondary advantage of the loaded whip is that the reduction of output signal power makes the w-t less prone to frontend "jamming" caused by signal overloads. Of course, the loaded whip cuts down maximum range. So, when you need maximum range, you can always switch back to the regular whip.